I have three raster layers covering the same geographic area. I would like to merge them into a single raster layer. The layers have different levels of importance, so I would like the merge to move through the rasters in an order that I specify, and assign the first numerical value it finds that isn’t zero to the output raster. If it doesn’t find any non-zero values, it should assign zero to the output raster. The following picture illustrates the problem. The green raster is more important than the blue raster which is more important than the yellow raster. When merging these three rasters, I want the tool to look for a value in the green raster: if this is any number other than zero, assign this value to the output raster. If it is zero, look in the blue layer: if this is not zero, assign this value to the output raster; if it is zero, look in the yellow layer. If the value of all three layers is zero, assign zero to the output raster. 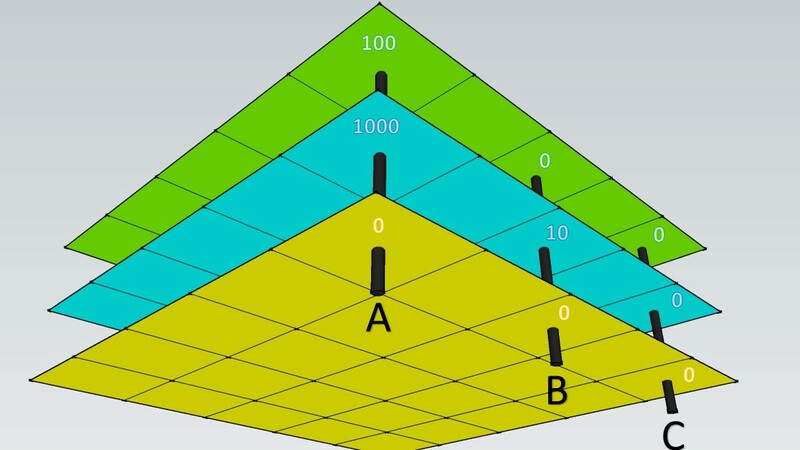 Using this illustration, the output raster would have a value of 100 in cell A, 10 in cell B, and zero in cell C.
I am using ArcMap 10.3 and have access to all tools. Not the answer you're looking for? Browse other questions tagged arcgis-desktop arcgis-10.3 spatial-analyst raster-calculator merge or ask your own question. Merging rasters which overlap using ArcGIS Desktop? Making raster output based on comparison between 2 input rasters using ArcGIS for Desktop? How to create weighted sum based on variety of features, rather than number of a single feature?